← The Fountain of Nature – Symbol of Abundance. Walk behind the water fall for a unique view of the world. 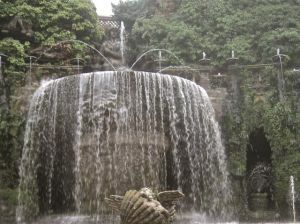 The Fountain of the Ovato allows you to experience the waterfall from inside. Renaissance Italian water engineers delighted in using water in every possible combination. Secret sprays would hit unsuspecting visitors to the gardens who stepped in a certain spot or leaned on a balustrade. The surprise sprays no longer work but we can still walk behind the curve of water at this elaborate oval fountain . . . looking out through the veil of water.